Though I had visited Petra in Jordan and Palmyra and Bosra in Syria, I was excited to visit Persepolis, Iran, which had seen great days during the Persian rule and later on the Greeks. There was a festive atmosphere with huge crowds milling around to get into the archaeological site after parking their vehicles and buying the entry ticket. Camels had lined up to let visitors take a ride if they so wished. Tall pillars with decorative blocks on top stood out against the backdrop of distant bare mountains. The site spread out in the valley though a few necrophilia are cut into the distant hillside. Through descriptive boards placed near the monuments, visitors are able to appreciate the greatness of this site which was granted World Heritage Site tag in 1979 by UNESCO. Persepolis, also known as Takht-e Jamshid, (Throne of Jamshid), was the ceremonial capital of Archaemenid Empire or the Persian Empire, which flourished from 550 –330 BC. The name of Persepolis is a transliteration of the Greek word that means Persian City. It was Cyrus the Great who chose this site but it was Darius the Great who built the Apadana palace and the Council Hall though it was completed during the reign of his son Xerxes the Great. Construction activities continued till the fall of the Archaemenid Empire. In 330 BC Alexander the Great invaded and destroyed Persepolis, looting and setting fire to buildings. It then became part of the Macedonian Empire. Its importance gradually diminished and finally lost to the world till it was discovered by a Spanish ambassador to the court of the Shah Abbas of the Safavid Dynasty in 1618 AD. After climbing the 111 steps made of local grey limestone, I came face to face with the magnificent monument at the entrance on the high terrace on which the main buildings were constructed. This is known as the Gate of All Nations or Xerxes Gate. There are inscriptions in three languages—Babylonian, Elamite and Persian. Four tall columns with decorative stone carved in various shapes adorn the top of the column. In front is a huge lion figure. These stand out as mute testimony to the glorious years of Persian rule. The highly developed Archaemenid cuneiform inscription is located here. On the terrace once stood a big hall—the treasury—that stocked valuable booty brought from captive lands that included gold, silver and precious stones. 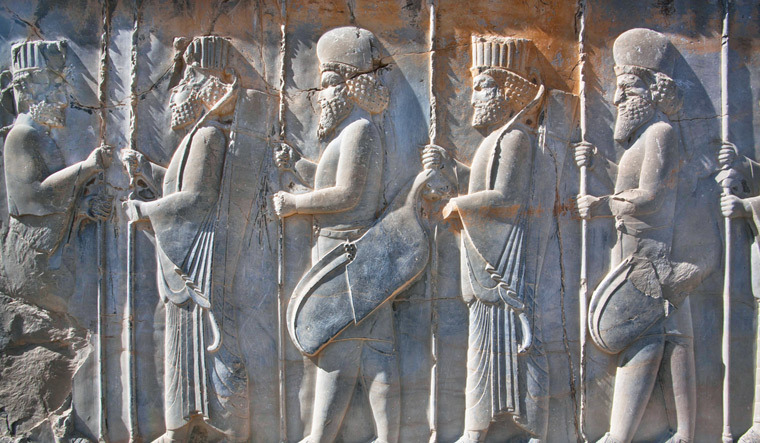 What is most striking about Persepolis is the large number of bas-relief, which have stood the test of time. One of the repetitive themes I saw was a bas-relief where a lion was attacking a bull, which was a symbol of Zoroastrian Nowruz—the power of the eternally fighting bull, representing the earth and a lion representing the sun. Bas-relief gives details of various events that took place during the reign of mighty Persian emperors, the territory they conquered and subjects who were part of the vast empire. Row of soldiers with spears, camels and horse-drawn chariots, people carrying gifts to the king, and king sitting on throne are some of the familiar bas-relief found at various places on the site. The site is littered with various objects such as fallen pillars, decorated pieces of stone and fluted columns. The conquered territories owed their allegiance to the king of Persepolis by offering revenue and gifts. A pair of Lamassus—bulls with the heads of bearded men—stand by the western threshold. Another pair, with wings and a Persian head (Gopät-Shäh), stands by the eastern entrance, to reflect the Empire’s power. Xerxes' name was written in three languages and carved on the entrances, informing everyone that he ordered it to be built. Next to Apadana is the Throne Hall which shows Xerxes on a throne. It is known as 100-column palace. Another bas-relief is Xerxes fighting a lion. The 70x70 metre hall was started by Xerxes but completed by his son Artaxerxes during the 5th century BC. The hall was used mainly to receive military commanders from the vast empire, which became later on an imperial museum. On the hill nearby are three rock cut tombs with richly decorated bas-relief. An interesting piece of architecture is the twin winged mythical figures mounted on a column. The tombs of a few Persian emperors are about 13km away at a place known as Naqsh-e Rustam (The picture of Rostam). Tombs of Darius, Xerxes and Artaxerxes are cut into the rock at a height of about 15 metres above the ground to make these all but inaccessible. Huge bas-relief adorns the hillside over which the tombs are located. Most of them relate to the conquests of the emperors. A modern museum within the archaeological site depicts objects of historical importance. Those who would like to see a few places in and around the site but are unable to walk prefer to ride a camel, though no animal is allowed within the site where monuments are located. It would be desirable to join a guided tour with a qualified guide. Cooler months would make the tour more enjoyable as it is located in a desert-like place. 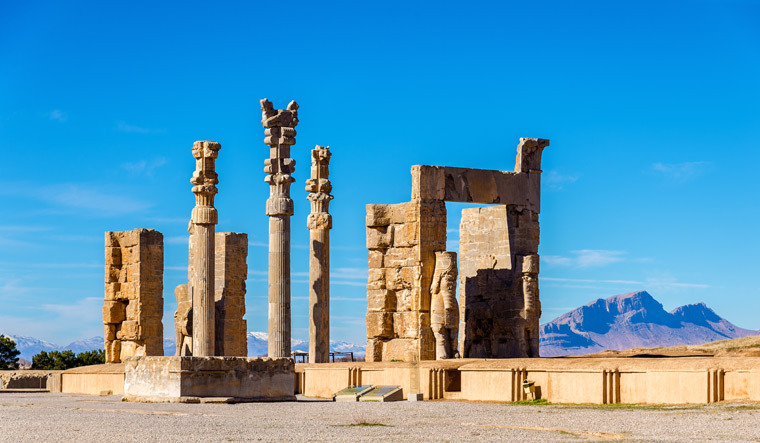 Persepolis that saw the glorious years of Persian rule with kings like the Darius the Great and Xerxes is a must-see tourist place in Iran. It is easily accessible by road from the town of Shiraz.